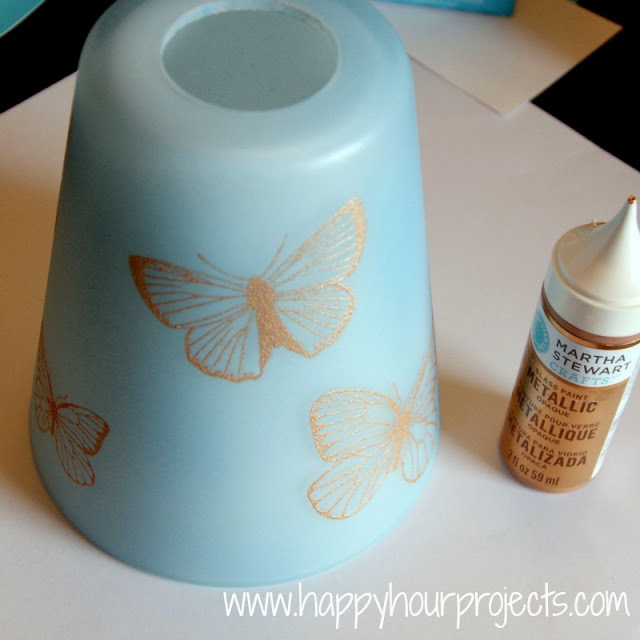 Do you need some fabulous glass painting ideas for all those random vases or dollar store glassware you have lying in wait? I certainly did! Fortunately, my bloggy BFF, Liz from Naptime Decorator made glass painting the focus of this month’s Craft Night. Be sure to check out all the amazing glass paint projects that were made. Below are a few of my faves and a few of my own! Plus, I’ve added a glass paint kit and hand-painted “tea time” mug to our Rewards Center to get you started. You can find details at the end of this article. 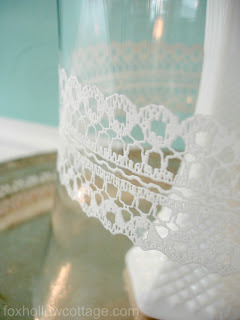 I love glass painting because it is so easy to add permanent color and design to basic, inexpensive pieces of glass! Pieces can be washed and used for decor or dining. 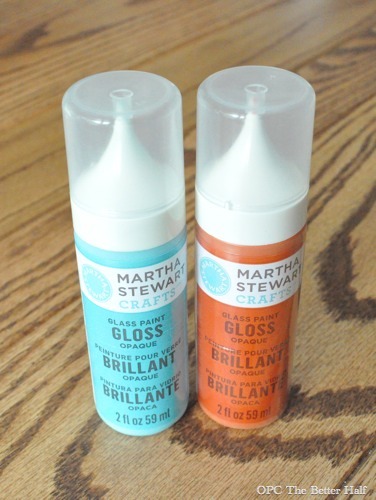 There are several different brands of glass paint available but Martha Stewart and DecoArt are the ones I’m familiar with. Martha Stewart’s glass paint can be cooked in the oven to become permanent. 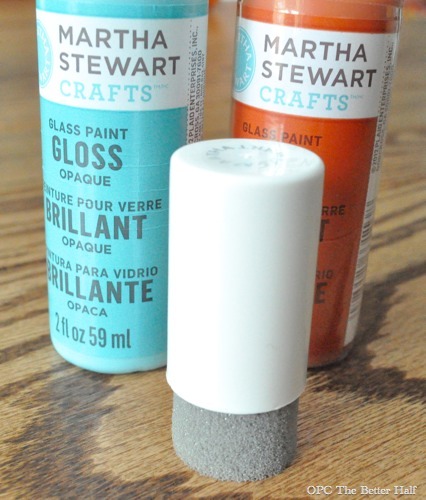 Martha also sells an “everywhere” paint that can be used on wood, fabric, metal, and glass, plus its cheaper than the paint just for glass. This “everywhere” paint has to cure for 3 weeks before it can be washed or sustain too much use. 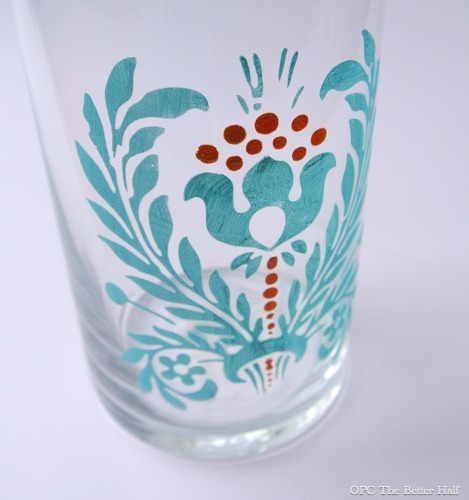 There are also lots of different ways to paint on glass – freehand, stencil, silkscreen, paint pens, or however you want! The best way to apply the paint with stencils is to use a pouncer (less paint gets under the stencil than when a paintbrush is used). Silkscreens also work well with pouncers and are cheaper than using the $14.99 scraper. I used a silkscreen for my coasters and vase, and I loved that the pouncer allowed me to create a varying density of paint. I love the Dollar Store basic white mugs and plates!!! I free-handed this tea bag and “tea time” with a small paint brush in one hand and a glass of wine in the other! lol. It turned out to be my favorite piece and it can BE YOURS! Find out how to bring this fabulous mug home at the end of this post. Next up, I painted these unfinished ceramic coaster that I bought at Michael’s for $3.99. I painted the base coat a light gray (because that’s what I had on hand) and then used the silk screen to layer different colors. 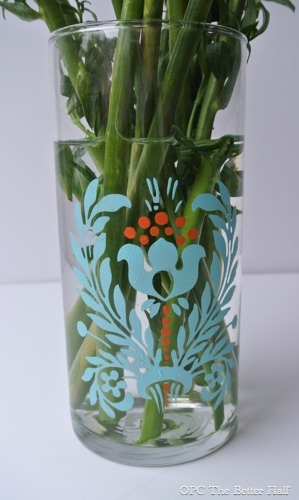 Last but not least, I bought this basic Dollar Store vase and added a pop of color with the glass paint and the silk screen. This took less than 5 minutes and the silk screen gives the paint a nice, even texture! Didn’t get enough glass paint ideas? Need some more? 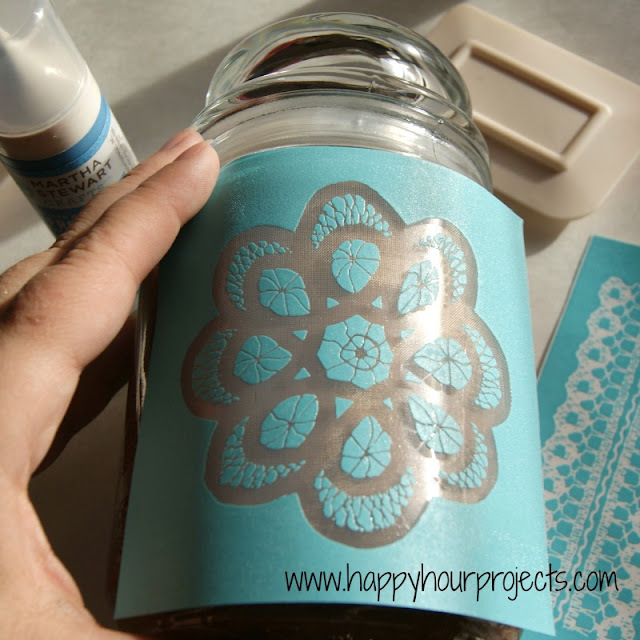 And now, even more projects for glass paint! Are you feeling inspired by all these fabulous projects but need some supplies? 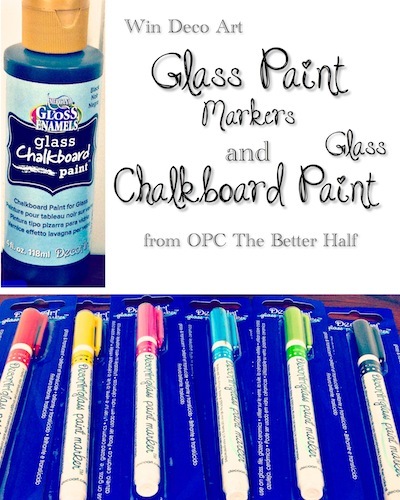 DecoArt has given us 6 Glass Paint Pens, 1 bottle of Chalkboard Glass Paint, and a stencil…and it can be yours! Take two minutes to register for our Reader Rewards program and bid to win! 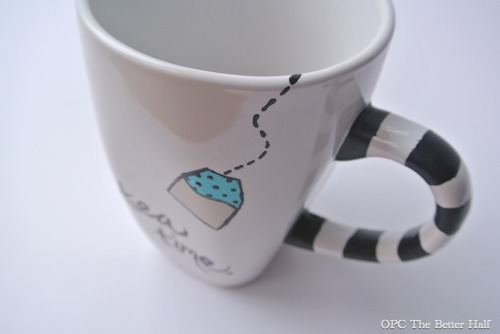 In addition to these cool DecoArt supplies, the “Tea Time” mug is also up for auction! YAY! Our Reader Rewards Program is sorta like eBay, but you use points to bid on lots of cool stuff like tools, gift cards and craft supplies. You get points for commenting and just visiting the site (just make sure you are logged in). It only takes a few minutes to sign up and we give you 10 points to start! woot woot. What do you think? 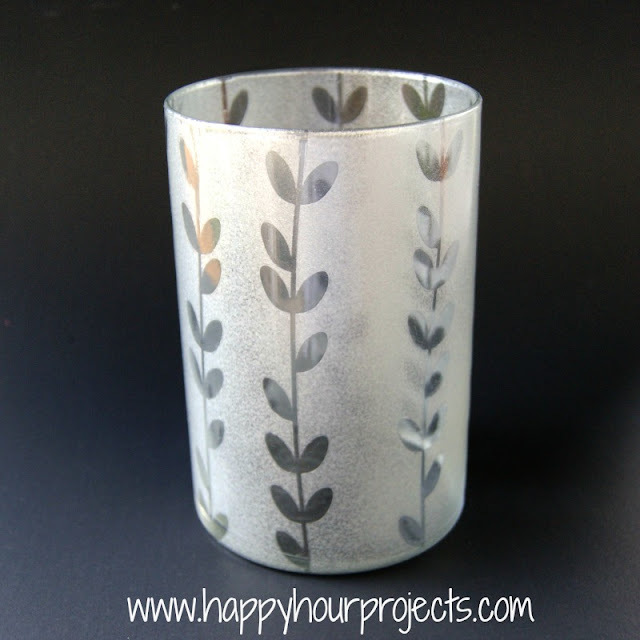 What’s on your glass paint project list? I was reading through to find the stencil for the tea time mug. Never gonna be able to free hand that myself! That’s great. hahaha, Thanks Brady! Did you see that we’re giving the “tea time” mug away in our Reader Rewards program?! Oh my gosh these are the cutest mugs! Im a sucker for a cute coffee mug and those hob nail sunshine ones … adorbs! Awesome projects! 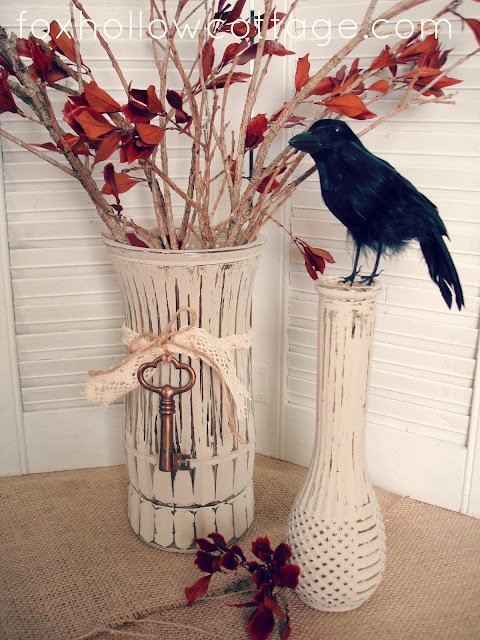 I was totally inspired to paint glass the first time I saw Adrianne’s frosted vine vase thing, so cute! How cute…I love the tea bag tab hanging over INSIDE the mug!! All those great tutorials is totally making me want that prize!!! Those are some great projects! I’ve not done any glass painting, but I’m definitely inspired by those gorgeous ideas! I wish my Mom could have seen it, she used to do glass painting every now and then. These are beautiful Jocie! And how can you beat the glassware from the dollar tree. Oh what fun ideas Jocie! Thanks for sharing all these fun ideas. 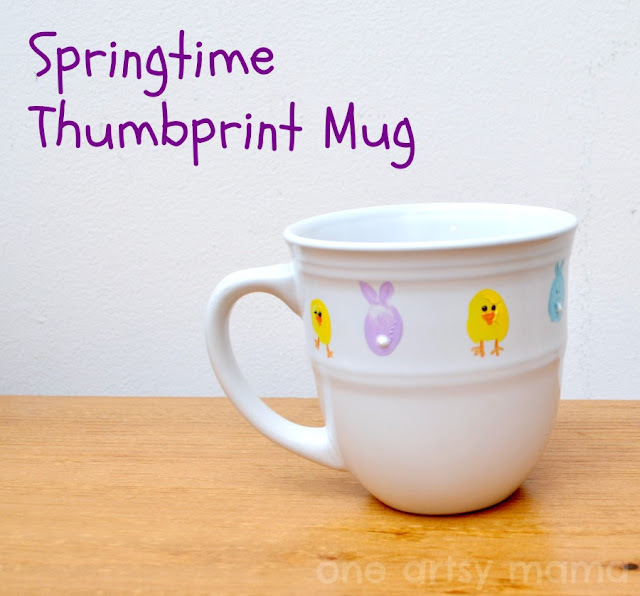 Really fun ideas Jocie – I love that tea time mug! So adorable! 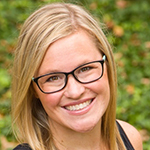 Thanks so much for sharing this at Project Inspired! Hope to see you at tonight’s party 8 pm EST! Oh man. You’re killing me with the fabulous craftiness ideas! How will I ever find time to do it all?! I am in need of some new “fun” mugs now that I have a Keurig. These are fabulous. The tea time mug looks great. 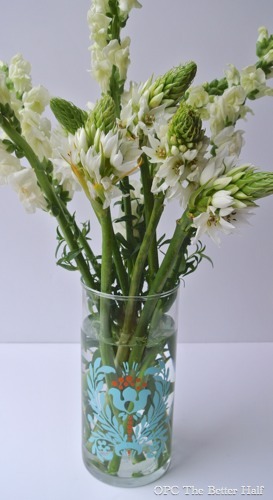 I have lots of plain glass vases leftover from floral arrangements I received as gifts. Glass paint would be a great way to dress them up. I have seen pins for using ceramic markers on pieces, and I was super excited to try it. 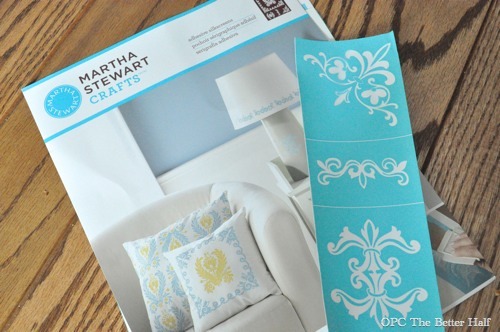 I spent quite awhile reading about the project and chose Pebeo vitrea 160 paint markers. I followed the directions exactly and was pleased with the project. However, I was so disappointed to find out after several washes the paint is starting to come off. Are these able to be washed and used. Does the paint last over time??? Your projects are very nice. Love these ideas they’re so pretty! exactly what to do and exactly what to say to make women feel attracted to them. right on her inferior vena cava.